OR Tambo flight booking with qualify to to participate in our flight vouchers for reviews program. Email a writeup of your flight to cheapflights@southafrica.to and we'll send you travel vouchers. Johannesburg Airport was renamed O. R. Tambo International Airport (ORTIA) on the 27th October 2006 (it was originally known as Jan Smuts Airport, but had been renamed Johannesburg Airport in 1994. The airport changed from the old ICAO code FAJS to FAOR, to reflect the new name, which caught some older pilots to make a few mistakes initially :) OR Tambo Airport is situated just east of Johannesburg in the Gauteng Province of South Africa, and is managed by the Airports Company of South Africa (ACSA). Strictly speaking though, the airport is in the City of Ekurhuleni, not Johannesburg. 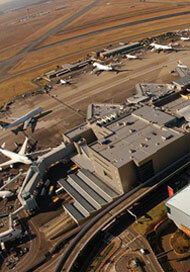 OR Tambo Airport is southern Africa's busiest air transport hub. Other names the airport goes by are "OR Tambo", ORT, JNB, ORTIA and Tambo. 2014-02-11 You got to be able to see to land. After dark in the evening runway lights weren't working for 35 minutes and a few aircraft were not allowed to land. 13-02-2019: OR Tambo International will undergo a R4,5 billion upgrade, starting this month. The first phase will see three new six-storey office buildings, a fitness centre, a canteen and a creche being added to the airport property. This will be the new head offices of Acsa and the SACAA. The other phases of the transformation will also see new offices, a retail space, hotel and conference facilities and other transit-related services. The development will also improve the airport's connectivity with the Gautrain. The first phase will likely finish in 2020 and no timeline has been provided on further phases. If you're in transit and don't want to waste precious time travelling between the airport and your hotel, we recommend either the Intercontinental OR Tambo, City Lodge OR Tambo Airport or the Protea Hotel Transit OR Tambo. The Protea Hotel OR Tambo you'll only be able to use if you've got an international flight, as it's situated behind immigrations for international departures. The City Lodge OR Tambo is situated above the multi-story parkade, and offers the cheapest option within walking distance of the airport. The Intercontinental OR Tambo Airport is situated just outside the terminal buildings, next to the car rentals building, and is the most upmarket of the 3 hotels at OR Tambo. Other hotels near OR Tambo Airport include the Protea Hotel OR Tambo, Garden Court OR Tambo and Premier Hotel OR Tambo. The cheapest spots to stay near the airport are in Kempton Park (e.g. the Airport Inn B&B or if you want ultra cheap, try Terrylin Backpacker's Hostel). The best rated spot is the Peermont D'oreale Grande At Emperor's Palace. Before you book to stay at a hotel far from the airport, do check whether they offer a shuttle service. From Pretoria it takes about 40 minutes to drive the 52km to OR Tambo International Airport. 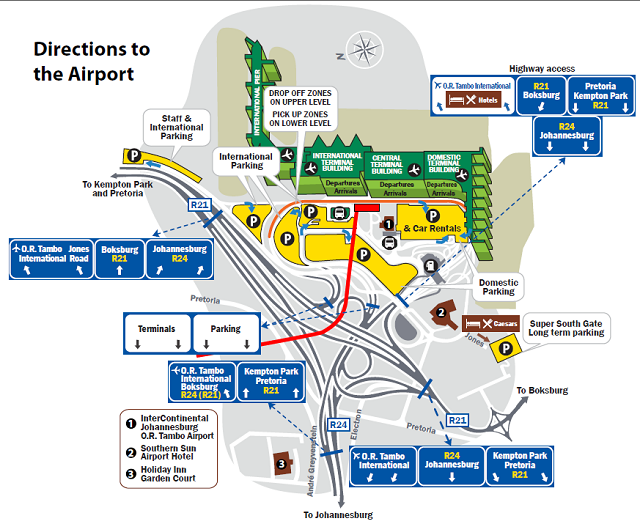 Drive south along the R21, and after 45km take the exit to OR Tambo International Airport/Jones Road, keep left at the fork to continue to OR Tambo, then take a sharp left onto OR Tambo Airport Road, take a slight left to stay on OR TAmbo Airport Road. From Sandton it takes some 30 minutes to drive the 30km to ORTIA. Turn onto Katherine Street heading east, turn right onto Marlboro Drive, take the ramp onto the N3, at the Gillooly's interchange keep left following the signs for the R24 towards OR Tambo, take exit for R24 towards OR Tambo keeping right to continue on the R24. From Soweto it takes some 40 minutes to cover the 58km to JNB. Take the N12 towards Johannesburg, take exit 67 to merge onto the N12 towards OR Tambo, At Gillooly's intersection keep left and follow the signs for the N12 to ORTIA, take exit 420 for R24 to OR Tambo. 2014-01-02 But Mom, they're taking our toys! 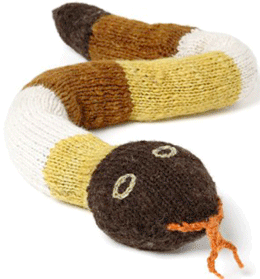 A 5 year old girl and her 6 year old brother had their toy snakes confiscated at by security at OR Tambo International Airport : Their father, Mr SJ Botha, said "They said we're not allowed a replica of a snake. It's not a plastic thing. If it was one of those little rubber ones, I would understand. But these are like a teddy bear, the kids use them as pillows." The family were on a flight home from Johannesburg to Cape Town. The kids' uncle, who wasn't flying with them, took the toys home with him. 2013-10-17 : OR Tambo International Airport wins Africa's Best Airport Award at the World Traveller Awards. 2013-08-04 : Check this Douwe Egberts cofee machine they set up at OR Tambo International Airport - it has facial recognition software which identifies the moment somebody yawns & then pours the coffee. 2013-07-26. The Oliver Reginald Tambo Memorial exhibition is unveiled at the international departures viewing deck. Manager of communications at OR Tambo International Airport, Unathi Bayatshe-Filils said "OR Tambo International Airport is honoured to have this iconic figure who stood for education and selfless sacrifice as our namesake. We always need to remind ourselves about the life and legacy of this revered elephant of the struggle for liberation and be able to inspire the nation. OR Tambo International prides itself in its rich history. We have a story to tell, of where the airport has been and of OR Tambo, the selfless icon after whom the airport was named. We also wanted to document the airport's history from its establishment in 1952 when it was still called Jan Smuts Airport, to Johannesburg Airport in 1994 as part of the new democratic order, and later OR Tambo International Airport." 2013-06-07. According to the Master International Destination Cities 2013 survey, Johannesburg had the 20th largest percentage increase in international arrivals over the last 5 years. 1 Jun 2013. The SAPS & OR Tambo International Airport hold a Fire & Safety campaign in Wattville, Benoni, to educate residents and provide hot water bottles and blankets as an alternative way of staying warm. 20 Apr 2010. President Jacob Zuma unveils a plaque to officially open the Central Terminal Building at Johannesburg's OR Tambo International Airport. Use the Airport Link to get from JNB to your destination. In order to curb illegal touting, ACSA has appointed a concessionary taxi and shuttle service that covers all major towns, suburbs, shopping centres and casinos. Please only make use of ACSA accredited and approved transport operators. Aproved operators display the ACSA logo on their vehicles and are available outside the arrivals terminals. Please use airport-approved operators only. Contact the ACSA information desks if you need help. Four bus companies shuttle passengers between the remote parking area and the terminal buildings; the average waiting time is no more than 6 minutes a trip. The buses can accommodate standing passengers, seated passengers and people in wheelchairs. The remote parking areas are fitted with intercoms linked to ACSA's joint operations centre, which allows passengers to contact the helpdesk. 2013-06-08 OR Tambo to allow shuttle services to compete with metered taxis: The Sisonke Taxi Association had complained that the Airports Company had given the OR Tambo International Airport Taxi Association (ORTIATA) exclusive rights to operate metered taxis from OR Tambo Airport, and was not allowing shuttle operators to compete with the metered taxi operators. ORTIATA was formed by the metered taxi operators who were successful in the initial ACSA tender in 1999. In a second tender in 2002 ACSA awarded the contract to the same metered taxis as in 1999, and then didn't go out to tender again - ACSA admitted that it had contravened section 5(1) of the Act by entering into an exclusive arrangement with ORTIATA. ACSA has agreed to issue a new tender for metered taxi operators. It was also agreed that ACSA should allow shuttle services to compete directly with metered taxis, in particular that kiosks be set up at both domestic and international arrivals to allow customers to book shuttle and taxi services. You can hire a car from OR Tambo International Airport with Avis, Hertz, Budget, First Car Rental, Europcar, Woodford or Tempest Car Hire. All car hire companies are situated in the parkade area adjacent to the Intercontinental Hotel. To get to the taxi and shuttle terminus: follow the taxi and shuttle icons to the terminus, which is opposite International Arrivals (Terminal A). To get to the bus and coach terminus: follow the bus and coach icons to the terminus, which is in the multi-storey parkade, behind the car-hire depots. The airport's pay-on-foot system, in use since March 1999, reduces queues and speeds up the payment process. ACSA has strategically positioned 38 pay stations in all of the parking areas. inserting your ticket at the exit to open the boom. The system accepts cash and credit cards, but a credit card limit does apply. O.R. Tambo International Airport has direct flights to all 6 inhabited continents. Most of the time flights land from the south and take off from the north. One of the longest international airways runway in the world is OR Tambo's ORL/21R, which is more than 4,400m long. For every 10,000 aircraft movements at Johannesburg Airport (OR Tambo International Airport) there are on average 5 bird strikes. Standing water on the airfield attracts birds, so removing the water helps make the area less attractive for them. Food waste attracts gulls, so removing food waste quickly helps reduce the number seagulls. At OR Tambo International Airport a Border Collie works tirelessly with its handler to chase away the local birdlife (without harming them!). Up to the first democratic elections in South Africa, O.R. 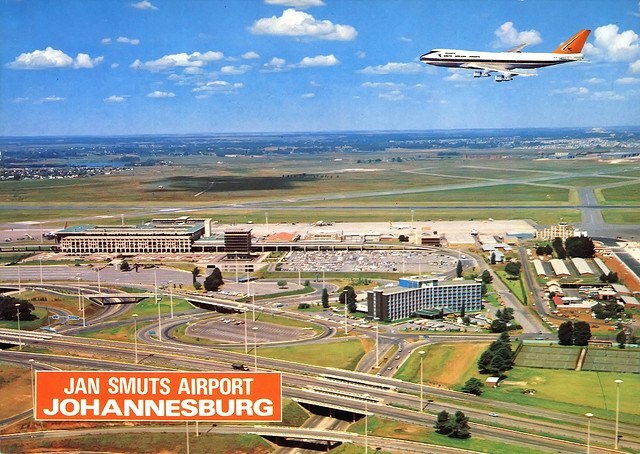 Tambo International Airport was known as Jan Smuts Airport. To ensure safety in poor weather conditions, the main runways at ORTIA are equipped with category II instrument landing systems and related visual navigational aids. using your cellphone to send to the number 35007 an SMS containing the flight number, in reply to which you will receive up-to-date flight details. a media conference room, often used by South African cabinet ministers as well as by foreign VIPs. a five star luxury hotel on the doorstep of the airport terminals. Internet access is available within the terminals using the Airport Online facility in International Departures. Two Airport Online stores are located in the domestic terminal. One is open to the general public and is located near the ATM area in the shopping area. The second is located for use by passengers only and is situated just after the main security point prior to the boarding gates. Dozens of airlines, South African and foreign, fly in and out of O.R. Tambo International Airport. There are numerous airlines operating international flights, and the main domestic carriers are BA, SAA, Fedair, Mango and Kulula. There is a luggage-storage depot on the upper level of the underground parkade, near the main lift lobby in International Arrivals. Mastercard and Visa accepted. Open 24 hours 7 days a week. Phone +27-11-3902318 to check what the current storage rates are. The foreign-exchange outlets of ABSA bank, American Express, Rennies and Master Currency are all in the public concourse of the International Arrivals hall. ABSA also has an outlet in the holding lounge of International Departures, but this is not for the use of South Africans. There are branches of Nedbank and ABSA on the mezzanine level of the public concourse in International Arrivals. level 1 of the shopping concourse in the Domestic Terminal. The airport has a chapel and a prayer area for Muslim passengers. The Premier Conference Centre in the Domestic Terminal offers a modern and stylish environment for business meetings, conferences and seminars. It has three 10-seater rooms, a 12-seater room, a 14-seater room, a seminar facility for groups of 25 or 50, as well as a conference room for groups of 60 or 120. Airport Online, which offers Internet access, has one branch in International Departures and two in the Domestic Terminal. One of these, which is open to the general public, is near the ATMs in the shopping area. The second, for use by passengers only, is between the main security point and the boarding gates. International Departures also offers a wireless option and a duty free shop, which allows laptop users with wireless cards to connect to the Internet from anywhere in the departures lounge - even from most of the restaurants in the terminal. If you fly frequently from OR Tambo International Airport you may want to buy 1 year worth of wireless access to the internet. ORTIA offers full portage services, so ensure you only use approved airport porters – who wear bright orange uniforms and navy-blue shirts, and carry ACSA permits. Porters can be found in the arrivals halls and outside the terminals in the area connecting the International Terminal and the Domestic Terminal. They work exclusively for tips: a general guide is to give R5 (five South African rands) a bag. There are VAT refund desks in the public area of International Departures (for use before check-in) and in the holding lounge . You need to have all invoices stamped by customs officials (in the public concourse of the same terminal) before proceeding to the VAT refund outlet.